Frankfurt Laser Company Adds Low Cost Strontium Detection Laser Diode to the Product Line. New FARL Series Laser Diodes are now available! Frankfurt Laser Company is pleased to announce its partnership with Eblana Photonics of Dublin, Ireland. 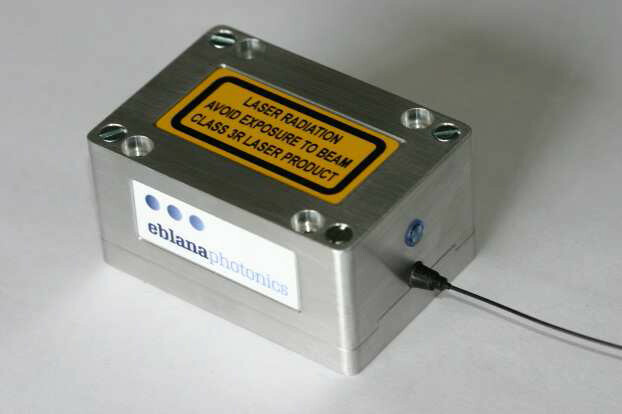 Eblana Photonics is a market leader in narrow-line width laser diodes in the range 690-2150nm. The products are found in a wide range of industries including Gas Spectroscopy, Aerospace, Test and Measurement and Fibre Communications. Frankfurt Laser Company is pleased to offer the FEBP line of discrete mode narrow bandwidth laser diodes. The laser diodes come in discrete wavelengths in the range 690-2150nm. Output powers are available up to 10mW from SM/PM optical fiber. The laser diodes have low spectral bandwidth 100 kHz (1540-1560) <2MHz and the housing incorporates an optical isolator to ensure performance stability. To complement the range of products that Eblana offer they now include the Laser Driver DX1 with integrated Current Source & Temperature Controller. This fully integrated unit is specifically designed to incorporate any of Eblana's existing DM laser diode Butterfly products, delivering precise TEC control and an ultra low noise current source for optimised laser performance. The DX1 series includes a specially configured version featuring Eblana's Narrow Linewidth (100kHz) Laser resulting in a high performance, narrow-linewidth laser module in a plug and play format at a very economical price point.